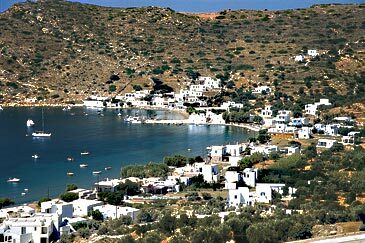 Great for beaches, walking and scenery, Sifnos is a very attractive island. All ferries arrive at Kamares in the NW, which has a nice waterfront and a good beach and is as far as most of the Martians get. The capital sits on a hilly plateau in the middle of the island; it comprises Apollonia and Artemonas – not twin Greek gods, but two sparkling collections of whitewashed houses and blue-domed churches of great charm. The excellent island bus service to all the beaches and villages fans out from here, with buses running as late as midnight between the capital and Kamares. The capital is also usually the starting point for walks and treks which are locally organised for visitors, using the many mule-tracks and other paths criss-crossing the island. 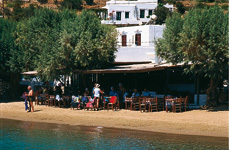 At the extreme north of the island is the tiny fishing port of Heronissos, a glorious quiet spot for lunch. On the east coast the amazing village of Castro, perched like a sentinel on the rocks, is a delight to wander round. 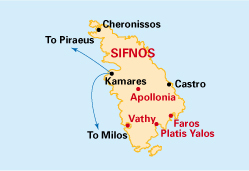 Further south are the two bays of Faros and Apokofto, flanked by Faros village and the delicate monastery of Chrysopighi, athwart its peninsula. 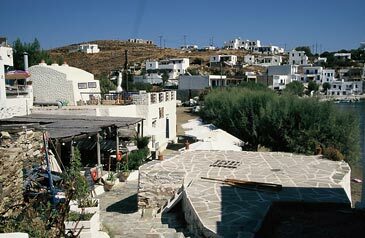 Faros village is miniscule, but has a narrow stepped main street flanked by houses and the odd shop and taverna on the way to the beaches. The best village view is from our Margharita Apartments. 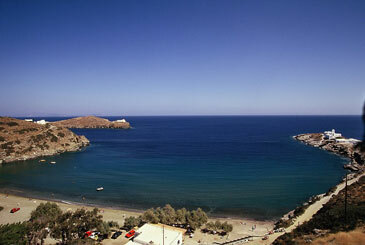 Just south of Faros lies the long sweep of sand that is Platys Gialos, arguably the island’s finest beach. There’s little serious development, just small pensions and rooms, including Ageliki’s near the far end. The gateway airport is Athens. 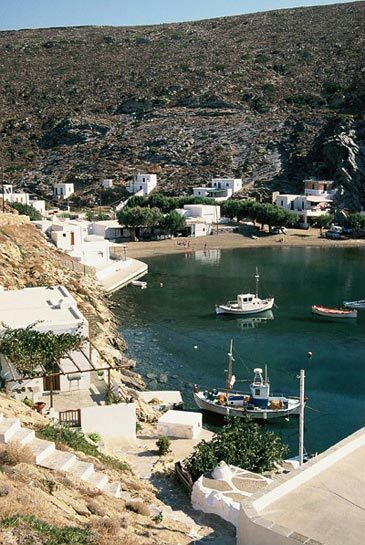 There is no airport on Sifnos so you take one of the fast ferries from Piraeus. 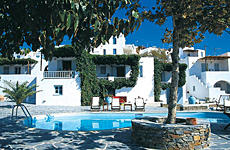 A hotel of great character, quietly situated near the centre with wonderful views across to Paros and other islands. The free-form pool is shaded by trees and equipped with loungers and the bar is nearby. You can relax in style and comfort here. Cat B superior; pool with jacuzzi, internet, air-con, TV, phone, mini-fridge, safe-box, hair-dryer, veranda. B&B. Airy position overlooking the village – sea view from most rooms. Studios, two bedroom apts with/without living room, all with kitchenette. TV, air-con ,coffee machine, balc/veranda. S/C 2-6 pers. On the beach, next to the taverna at its far end. The studios have three single beds (apartment has twin + twin sofas in living room), kitchenette and large balconies. On the beach near the end of the road and bus to town. Shady terrace overhangs the beach. Simple, but clean and nice. TV, fridge, air-con, balc. RO.